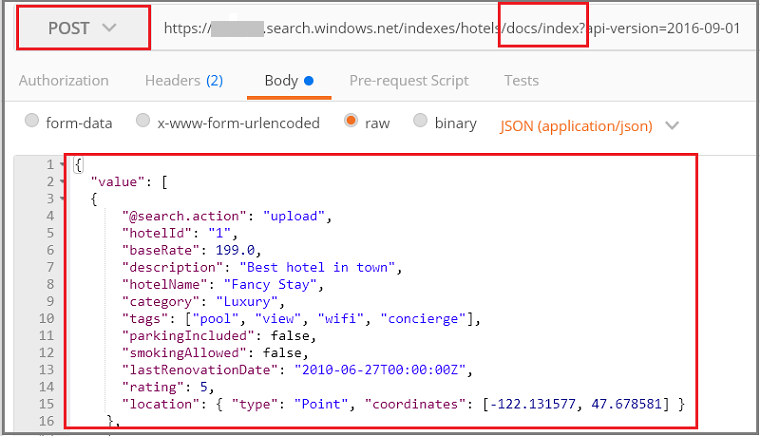 One of the easiest ways to explore the Azure Search REST API is using Postman or another web testing tool to formulate HTTP requests and inspect the responses. With the right tools and these instructions, you can send requests and view responses before writing any code. If you don't have an Azure subscription, create a free account before you begin and then sign up for Azure Search. Postman desktop app or Telerik Fiddler is used for sending requests to Azure Search. In this section, use your web tool of choice to set up connections to Azure Search. Each tool persists request header information for the session, which means you only have to enter the api-key and Content-Type once. Notice the HTTPS prefix, the name of the service, the name of an object (in this case, the indexes collection), and the api-version. The api-version is a required, lowercase string specified as "?api-version=2017-11-11" for the current version. API versions are updated regularly. Including the api-version on each request gives you full control over which one is used. In Postman, formulate a request that looks like the following screenshot. Choose GET as the verb, provide the URL, and click Send. This command connects to Azure Search, reads the indexes collection, and returns HTTP status code 200 on a successful connection. If your service has indexes already, the response will also include index definitions. In Azure Search, you usually create the index before loading it with data. The Create Index REST API is used for this task. The URL is extended to include the hotel index name. The fields collection defines document structure. Each document must have these fields, and each field must have a data type. String fields are used in full text search, so you might want to cast numeric data as strings if you need that content to be searchable. Attributes on the field determine allowed action. The REST APIs allow many actions by default. For example, all strings are searchable, retrievable, filterable, and facetable by default. Often, you only have to set attributes when you need to turn off a behavior. When you submit this request, you should get an HTTP 201 response, indicating the index was created successfully. You can verify this action in the portal, but note that the portal page has refresh intervals so it could take a minute or two to catch up. If you get HTTP 504, verify the URL specifies HTTPS. If you see HTTP 400 or 404, check the request body to verify there were no copy-paste errors. An HTTP 403 typically indicates a problem with the api-key (either an invalid key or a syntax problem with how the api-key is specified). Creating the index and populating the index are separate steps. In Azure Search, the index contains all searchable data, which you can provide as JSON documents. The Add, Update, or Delete Documents REST API is used for this task. The URL is extended to include the docs collections and index operation. The Request Body contains four documents to be added to the hotels index. In a few seconds, you should see an HTTP 200 response in the session list. This indicates the documents were created successfully. If you get a 207, at least one document failed to upload. If you get a 404, you have a syntax error in either the header or body of the request: verify you changed the endpoint to include /docs/index. For selected data sources, you can choose the alternative indexer approach which simplifies and reduces the amount of code required for indexing. For more information, see Indexer operations. Now that an index and documents are loaded, you can issue queries against them using Search Documents REST API. The URL is extended to include a query string, specified using the search operator. 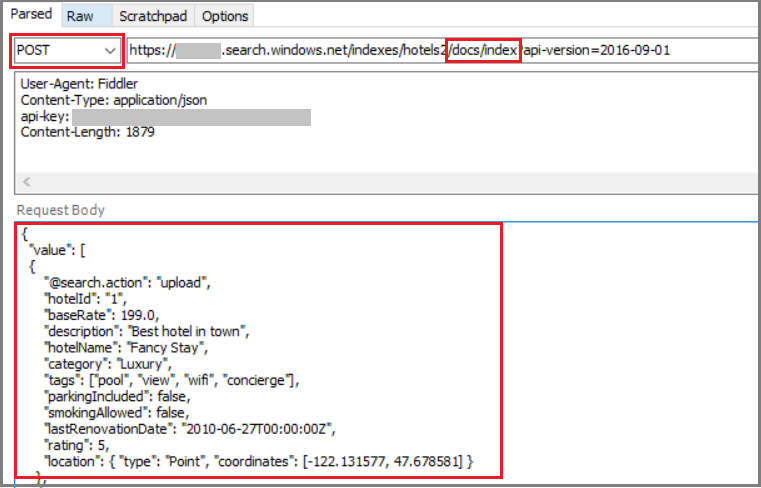 This query searches on the term "motel" and returns a count of the documents in the search results. The request and response should look similar to the following screenshot for Postman after you click Send. The status code should be 200. In Postman, your request should look similar to the following, and the response includes a document count and space used in bytes. Notice that the api-version syntax differs. For this request, use ? to append the api-version. The ? separates the URL path from the query string, while & separates each 'name=value' pair in the query string. For this query, api-version is the first and only item in the query string. For more information about this API, see Get Index Statistics (REST). Formulate a request that looks like the following screenshot. Choose GET as the verb. Fiddler adds User-Agent=Fiddler. You can paste the two additional request headers on new lines below it. 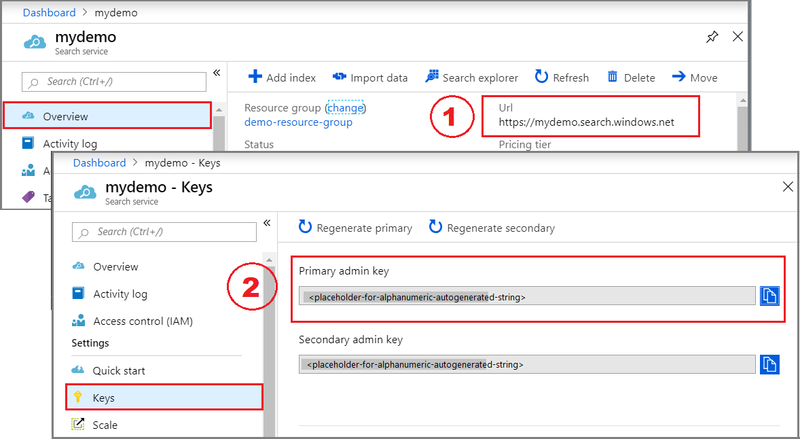 Include the content type and api-key for your service, using the admin access key for your service. Turn off web traffic to hide extraneous, unrelated HTTP activity. In Fiddler's File menu, turn off Capture Traffic. Change the verb to PUT. Copy in a modified version of this URL: https://<placeholder-for-your-service-name>.search.windows.net/indexes/hotel?api-version=2017-11-11. Copy the index definition provided above to the request body. Your page should look similar to the following screenshot. Click Execute on the top right to send the completed request. Change the verb to POST. Change the URL to include /docs/index. Copy the documents into the request body, similar to the following screenshot, and then execute the request. The following example query is from the Search Index operation (Azure Search API) article. Many of the example queries in this article include spaces, which are not allowed in Fiddler. Replace each space with a + character before pasting in the query string before attempting the query in Fiddler. In Fiddler, click the Inspectors tab, click the Headers tab, and then select the JSON format. You should see the document count and storage size (in KB).